When I was at the Better With Pets Summit, I had the pleasure of meeting Abbie Tuller. Abbie is the Senior Director of Domestic Violence Programs at URI (Urban Resource Institute) in New York City. URI is a very special organization; one I first heard about last year at the Better With Pets Summit. I can’t tell you how happy I was to meet Abbie and talk to her more about what is happening with domestic violence shelters in NYC. 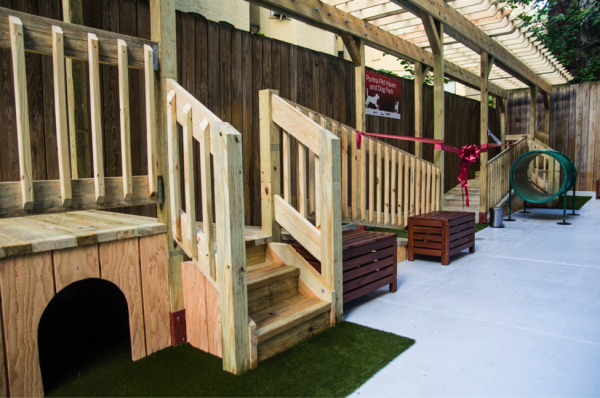 On October 13th, URI and Purina Petcare hosted a ribbon cutting at Urban Women’s Retreat (UWR), a Tier I emergency shelter that is part of URIPALS (People and Animals Living Safely) program. What makes this place so special? 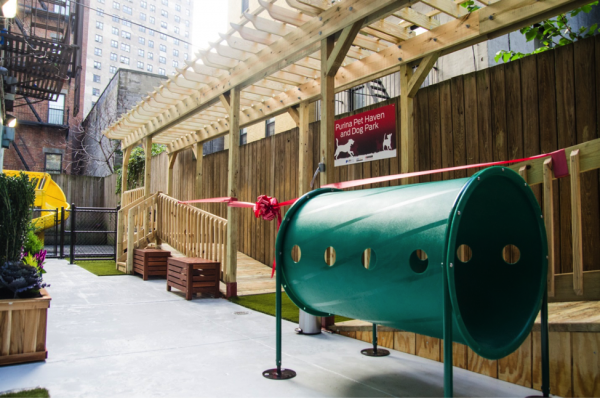 It is home to Manhattan’s first-ever dog park in a domestic violence shelter. URIPALS is the only program in NYC and one of the few nationally that allows survivors of domestic violence to live with their animals. Think of the significance of that please. Many women may not leave a violent situation because they don’t want to leave their pet. They may fear for their pet’s safety or their love for their pet prohibits them from leaving them behind. With URIPALS, they don’t have to leave behind their furry loved ones. I know that it would be an issue for me if I were in that situation. URIPALS has helped 43 families with 63 pets (as of October 2015). There have been 38 cats, 18 dogs, and a range of other small animals from reptiles to fish. The dog park that is now part of UWR provides survivors of domestic violence and their families with a safe and calming retreat. Abbie said that many of the guests at UWR go and sit in the dog park because of its peaceful atmosphere and it has become quite a popular area in the shelter. This dog park is called Purina Play Haven. This is not the first time Purina has helped with the URI. 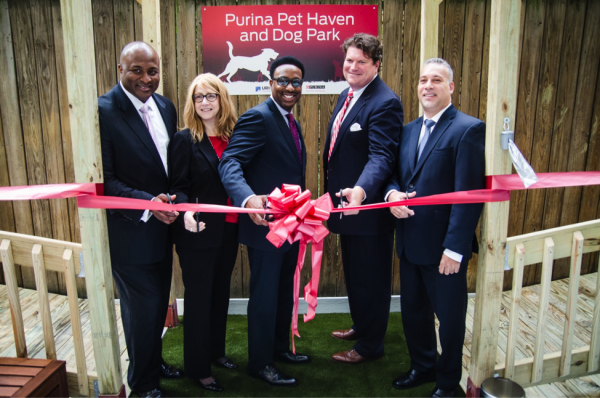 In the spring of last year, Purina sponsored the creation of the Purina Play Haven at URI’s Safe Haven shelter in Brooklyn, the first-ever dog park at a domestic violence shelter in New York. This was a monumental event and one that I was so happy to hear about. Since its opening, the park at Safe Haven has served as a vital component in the healing process for a number of families and their pets, one of which I remember speaking at the Better With Pets Summit last year. I was moved to tears hearing about her story and how having her cat with her made her transition easier. As part of its support for the URIPALS program, Purina is also donating Purina ONE dog food, Purina Cat Chow brand cat food, treats, and cat litter. Purina is also working with URI to provide supplies for welcome kits for families bringing pets to the UWR center. 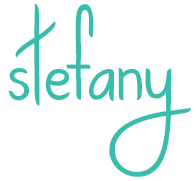 These welcome kits will include pet travel carriers, safety gates, pet beds, pet feeding and watering bowls, cat scratching posts, leashes, and pet toys. I have always been a huge fan of Purina but this makes me feel even more warm and fuzzy feelings about the brand. What they do for animals is one thing, but what they are doing for these families is truly amazing. Thank you Purina for truly making life better with pets!